Water flossers are great for people who don’t like to floss, have sensitive gums, or have some kind of dental or orthodontic work. Water flossers reduce the pain of flossing by running a warm jet of water over the gums to irrigate the spaces above, below and in between teeth. Some water flossers come with special tips perfect for kids with braces. Tips may come with strings to redirect the jet of water to get around braces while gently massaging gums at the same time. Meanwhile, you should find a water flosser that gently washes away any debris because your teeth are already sensitive with the dental work.Because there is no string, water flossers can remove food, debris and plaque without interfering with your braces. However, a water flosser should not fully replace regular flossing with string over the long term. 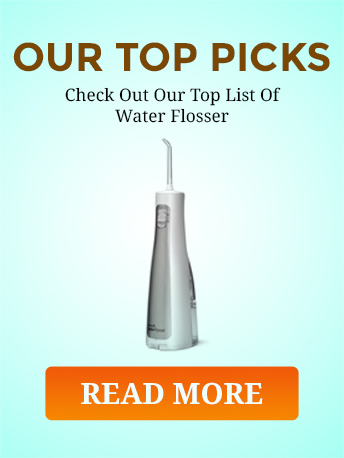 Read on to discover five Best Water Flossers for Braces that are the perfect options. 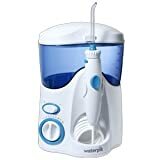 ​The Waterpik ultra water flosser is a countertop model that has everything you need to wash away any debris within your teeth. You get six color-coded tips with the device, including one designed specifically for braces in mind. 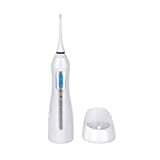 At 1,400 pulses per minute, the water pressure is gentle on your gums while it rinses away anything left after brushing.The dial on the water flosser shows you easy controls so you can adjust the pressure of the water. The long cord lets you set the water flosser away from the sink. The reach is also perfect if you have more than one sink or a very large bathroom.The reservoir holds 650 milliliters of water, which is enough for 90 seconds of washing on certain settings. You can adjust the flow of water from 10 to 90 pounds per square inch among 10 settings on the knob. Waterpik calls this the ultra water flosser, and it really is for the price. Extra tips stay out of the way in the lid. This keeps your tips clean. Make sure to empty the water reservoir after each use to prevent any buildup or mold from forming. If you keep this device maintained well, the Waterpik ultra water flosser can last a long time. Waterpik also makes a power flosser that is hand-held and battery powered. The FLA-220 uses no water at all. Instead, this device has a rubberized tip that vibrates back and forth to loosen stuff caught between your teeth and behind your braces. Because there’s no strings, this is a fantastic option for people who have braces.The tip vibrates at 10,000 strokes per minute thanks to power supplied by a AA battery. Under normal use, you may have to replace the battery after a few weeks. Everything fits into a handle just 7 inches long. This piece is extremely lightweight at less than 3 ounces, so you can take this wherever you go. For someone who has braces, this is perfect for teens eating lunch at school or college students on the go.There are two major downsides. First is the power consumption as you may have to have replacement batteries on hand. Second is that the tips have a hard time with teeth that are too close together. If you have two teeth that come up against each other, the tip can’t reach where string may be able to go. However, the tips can clean directly behind braces if you have problems with food and debris building up there. The tips may wear out quickly if you use this a lot, but this hand-held power flosser comes with a pack of 15 removable tips. ToiletTree has a decent oral irrigator that is portable and runs on a lithium ion battery. Hold the entire contraption in your hand as you work water around your teeth with skinny tip. ToiletTree improved on previous versions by making this water flosser quieter and easy to use. This water flosser has a soft mode and normal mode. Normal mode lasts for about 60 seconds, while soft mode goes for 75 seconds. Buttons on the side let you change modes, while lights show you precisely what’s happening. Fill the reservoir quickly with a wide lid that snaps shut securely on the back of the reservoir. Instead of pulling off the tip, a quick-release button lets you replace the tip without a lot of fuss. You no longer have to struggle to maintain this water flosser so you can enjoy the experience without having to wrestle with the mechanism.The battery lasts longer now, thanks to a lithium ion upgrade. The motor also runs quieter than before. All you do is fill the reservoir and enjoy cleaner teeth. If you want extra freshness, use a little bit of mouthwash instead of water in the reservoir. ToiletTree may be a lesser-known manufacturer of water flossers, but the company listened to consumers and improved on previous models. This portable model fits easily into one hand. You can take the packaging with you on road trips if you don’t want to buy a bag to carry your water flosser. 2Nice has a wonderful entry with its portable, USB-charging water flosser that also doubles as a nasal irrigator. A timer stops the water flosser every two minutes. The water reservoir holds 200 milliliters of water and it sits below the motor. You may have to refill the reservoir a few times before you can clean your entire mouth, but this compact, portable system works well when you want to foss on the go. The water flosser comes with four tips, one of which narrows the stream of water for a more precise and higher-pressure wash. Two wider tips irrigate behind braces. Unlike other portable models, this comes with its own travel bag for stow-and-go portability. Bring this to school or on a road trip. The USB cable serves as a charging port, which is also different from similar models. That means you could, theoretically, charge this from your desktop or laptop computer at school. You can also use an adapter for a phone charger to add power to this water flosser. For people with braces on the go, 2Nice has a decent piece of hardware. Simply unscrew the bottom portion, fill the reservoir with warm water and you’re set to go for 30 seconds of cleaning. Timer stops the water automatically. Dental Spa has a good, basic water flosser that’s less expensive that other models. The large button switches the device from Off to Low or High very easily. This model comes with two color-coded tips for multiple users in one household. Tips fit securely while unscrewing from the base easily for when the water flosser is not in use. The water reservoir easily detaches, but you may find it hard to fill if you bathroom sink has a low water spigot. The reservoir holds 165 milliliters of water, which is good for about 30 seconds of washing. You may have to refill this device before cleaning all parts of your mouth. This has a slimmer and more compact design than other portable water flossers, which makes it easy to grip. The ergonomic handle is good for people with small hands, such as younger teens with braces. The grip also works for people with arthritis. With just two modes, you don’t have as much control as you would with higher-end models. However, if you want a good water flosser you can take with you, this battery-operated device works well. You need two AA batteries for this to work, and it doesn’t recharge. The best water flosser for braces is, by far, the Waterpik ultra water flosser. You get several tips stored in the lid, ultimate control over your water pressure and specially designed tips that help remove debris from behind braces. The water flosser is small enough to be out of the way on your bathroom countertop. The long cord stretches wherever you need to go.If you need a portable water flosser to take to school, 2Nice’s model is nifty because of the way it charges and the handy travel bag. Each of these flossers adds an extra amount of clean to your mouth, but Waterpik and 2Nice are better, depending on your needs.